One of the most popular ways of burning calories without placing stress on the joints, pedaling on the best upright exercise bike helps you lose weight, build endurance and improve your fitness and health. These bikes can likewise be used for rehabilitation purposes are they allow you to adjust the level of resistance from low to intense depending on your fitness goals. What’s great about these machines is that they are very quiet and run smooth. Our reviews below cover the top upright stationary bikes. We don’t however include spin bikes which we feel are a totally different kind of exercise bike since they function differently. 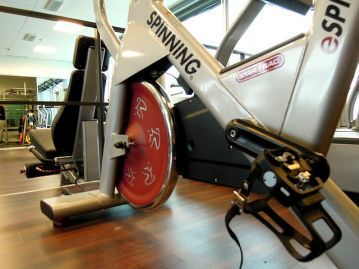 If you are more interested in spin bikes, check out our top spin bike reviews here. Compact exercise bike: For the space conscious, this is one of the least bulky stationary bikes around. It’s frame is foldable too so it lets you cut down on its footprint when you’re not using it. When fully assembled its dimensions are 31 inches long by 19 inches wide and 46 inches high. While not as large or a bulky as most other fitness bikes, this unit is designed to be sturdy and rated to hold up to 300 lbs. which makes it have a capacity that’s higher than some of the less space economic products. With an adjustable seat height, users who are between 5’3” and 6’3” can use this machine just by using the adjustment knob below the saddle and then adjusting the height of the seat. One of the best features we like about this indoor bike is that is runs very quietly, even when set to the highest of the 8 tension levels. This allows you to workout and still watch TV or do your cardio routine in the morning or at night without bothering others. Desk exercise bike: One of the things that many people don’t like about cardio machines like stationary bikes is that you can spend a lot of time on the machine such that it can become boring after you’ve done it for a few weeks. To make the workout less of a routine, not to mention boring, how about being able to do something while you burn calories. The FitDesk v2.0 is designed just for that. The unit uses a very similar design and built as the Exerpeutic bike above however it had one major addition, a desk feature. The desk measures 16 inches by 19 inches and can be adjusted. It also has a storage drawer where you can keep accessories as well as items you often use while riding the fitness bike. The flat desk surface allows you to set down your laptop and read, go through your emails, chat, watch videos or listen to music while working out. You can likewise use the desk for reading magazines or books. This is another compact unit that folds up into a small package when not in use. It also adds a backrest that allows you to lay back against while you pedal and work. As far as multitasking, being productive and making the most out of your cardio workouts, the FitDesk v2.0 is the best upright exercise bike. Along the lines of the more traditional stationary bike design, we have the Schwinn A10. This is an older model that continues to offer a great deal of value. Very affordable it allows you to get many of the amenities that the exercise bikes you see in the gym have. This is something that isn’t available with the 2 bikes above. 8 magnetic resistance levels: Easily set from the push button control panel you can change the pedaling level of difficulty from light all the way to hard. This allows you to change not only the amount of intensity of your workouts but also how much you want your leg muscles to work. 7 training programs: The A10 includes 6 profile workout programs and 1 quick-start so you can switch between the fun workouts, and those more challenging like going uphill. The variety allows you to simulate different workout environments to burn more calories. Fully interactive user interface: unlike the cycles above, this has a large control panel that includes one-touch buttons that let you change resistance levels upward or downward. It also lets you switch between workout programs through buttons. Finally a 5” by 3” LCD screen shows all your current settings plus tracks, workout distance, time, RPM, calories and more. Audio speaker system: the unit’s console is MP3 ready allowing you to plug in your audio player and listen to your workout playlist from the bike’s speaker system. Feature Filled Controls: For more workout options and features you can move up to the Schwinn 170. This is a step up from the A10 as it offers more fitness programs as well as resistance levels. It also comes with a handy USB data port where you can extract your workout stats so you can track how you’re doing and adjust your future sessions. With a more high-tech designed control panel that features dual LCD screens it allows you to track everything from your heart rate all the way to your current workout’s intensity level. This bike also has a slightly higher maximum user weight capacity of 300 lbs. compared to the 275 lbs. of the A10. 29 preset workout programs: This is a lot to choose from and it offers a wide variety of workout styles including those for beginners, those based on heart rate, for testing fitness and even ones you can customized. 25 levels of resistance: The high number of resistance levels allows you to built your endurance and fitness as you go. You can begin with a level that’s comfortable for you can work your way as far as you can. You can also switch up and down to vary the workouts to keep the body guessing. USB data transfer: this lets you save and export your workout settings and statistics to Schwinn’s online site as well as MyFitnessPal. Being able to do so gives you the ability to analyze how to can optimize your training to burn more calories and adjust your workouts to do so. If you’re not a fan of magnetic resistance bikes where the level of difficulty when you pedal is controlled by a machine you may want to try wind resistance bikes. These bikes give you total control of the level of difficult as the resistance is based on the fan blades moving in the housing. As you pedal faster, the difficulty increases. When you slow down it becomes easier to pedal. This allows you to change your paces within your session to do sprints in one moment and then switch to a slower pace then back again without having to go through the control panel and settings. Another advantage that the AD6 offers it that it comes with moving arms. The handlebars work as moving arms that let your work both upper and lower body simultaneously. In essence, you can say this is an exercise bike that includes some elliptical trainer features. Being able to work both arms and legs together burns more calories as the body does more work. Very solidly built, it pedals very smooth and does not wobble while your cycle. You can likewise just use the arms without the cycle if you wish. Either way you get to sit on a comfortable saddle that’s well padded. One thing of note is that depending on how fast you pedal, it can get noisy. Since it runs off of a fan. The harder you pedal, the faster the fan blades turn which causes a louder whirring sound, something that isn’t present with the magnetic exercise bikes above.